SO. 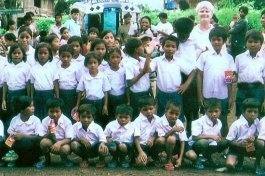 LAOS' RURAL EDUCATION SUPPORT AND REMOTE VILLAGE DEVELOPMENT. Traveling in Southeast Asia for several years, mesmerized by the developing country of Laos, one of the ten poorest nations in the world, Mary D. Meyer found it difficult to ignore the extreme poverty she saw. She soon realized she could no longer continue to “do nothing” to assist these proud, desperately poor, rural Laotian people. Retired from the hospitality industry, Mary’s answer to“do something” was founded in INDIGO THREADS in 2005. The Education Support and Rural Village Development Non-Profit Humanitarian Organization is assisting 16 villages and schools in Champasak Province, Southern Laos. INDIGO THREADS gives the gift of education; a gift that lasts forever. 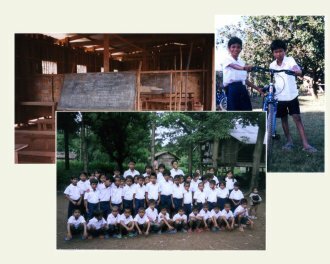 INDIGO THREADS' programs support STUDENTS with uniforms, textbooks, school supplies and bicycles. The innovative, one of a kind school lunch program addressing hunger and acute malnutrition provides a healthy school lunch for 1,750 students per week. SCHOOLS are supported with school furnishings of desks, blackboards and sporting equipments. INDIGO THREADS first constructed 3-classroom school was donated and dedicated on September 7, 2007. Continuing with an aggressive construction program, a second 3- classroom building was completed and donated within one year's time at Ban Lieng Secondary School on September 12, 2008. When building new schools, clean, safe drinking water, a luxury in developing countries and the absence of latrines are both addressed. Building repairs and improvements are a part of the school construction program. TEACHERS receive supplies and teaching aids to assist with active learning. Through Indigo Threads Teacher's Training College Scholarship Program, 3 new teachers have been added to the Lao Ministry of Education with 8 new scholarships awarded. To promote reading in schools, a Reading/Recreation Program has been developed, supplied with hundreds of children's books and interactive material. Encompassing the entire circle of education support, VILLAGES are assisted with village community well repairs, supplemental rice, emergency health care, medicine, clothing and life's emergencies. Indigo Threads works in direct, 'hands on' co-operation with District Education Departments, teachers and village leaders to determine needs and monitor Programs. INDIGO THREADS is a small, humanitarian organization registered in the United States as a 501-C-3 charitable non-profit public corporation. Your donations will support and expand INDIGO THREADS programs assisting the Laotian people with the dignity of basic survival needs. Check the 'blog' section for current news and updated programs. Pay Pal can be found of the donation page. THANK YOU FOR YOUR GENEROUS SUPPORT.